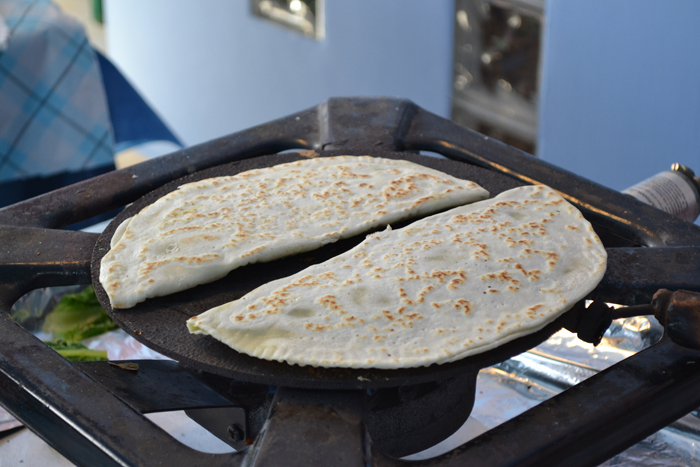 Having just returned from a wonderful press/blog tour in Romagna, aptly called ‘Loving Romagna‘, I can’t help writing about one of my favorite foods from the area: piadina. 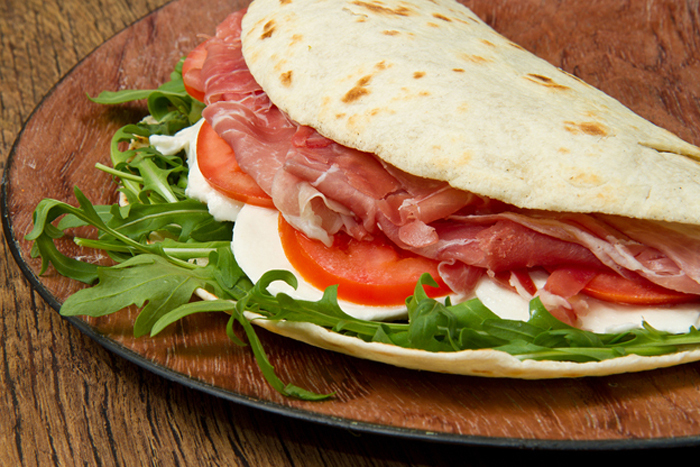 Also known as piada, it is a thin flatbread, made with white flour, lard or olive oil, salt and water, and usually filled with prosciutto, squacquerone or stracchino cheeses, and arugula (and if you wish to end your piadina meal on a sweet note, have one with Nutella!). It is thought that piadina originated in Roman times, although the first written evidence of piadina as it is recognized today dates to 1371, when Cardinal Anglico provided the recipe for the “bread of the people of Romagna” in the Descriptio Romandiolae. The great Italian poet Giovanni Pascoli, who was born in San Mauro di Romagna, popularized the word piada, describing it as the “bread, no, the national food of the Romagnoli”. And this is the definition I’m going to stick with, as ‘street food’, as I’ve seen it called, sounds quite limiting to me! Last year, the European Union granted piadina ‘Protected Geographic Indication’ status (IGP in Italian or PGI in English) to safeguard it from poor quality imitations and fakes. The IGP certification means that piadina is now recognized for its importance as a traditional and quality food and will be receiving formal protection. The IGP designation, along with the even stricter Denomination of Origin (DOP in Italian or PDO in English) trademark, is used to protect from fakes some of Italy’s most iconic products, such as Parmigiano Reggiano and balsamic vinegar, which are also typical of the Emilia Romagna region. While on the blog tour, I attended a cooking class at the Hotel Eliseo in Bellaria-Igea Marina held by the hotel’s cook, sweet Nonna Violante, the classic “zdora romagnola”, who taught us among other things how to make piadina. Here’s her recipe (if, like me, you don’t want to use strutto – lard -, substitute with olive oil). On the worktop, make a well in the center of the flour, add all the ingredients and mix until you get a soft and elastic dough. Make small balls and, using a rolling pin, roll the dough very thinly. Cook on a hot griddle. 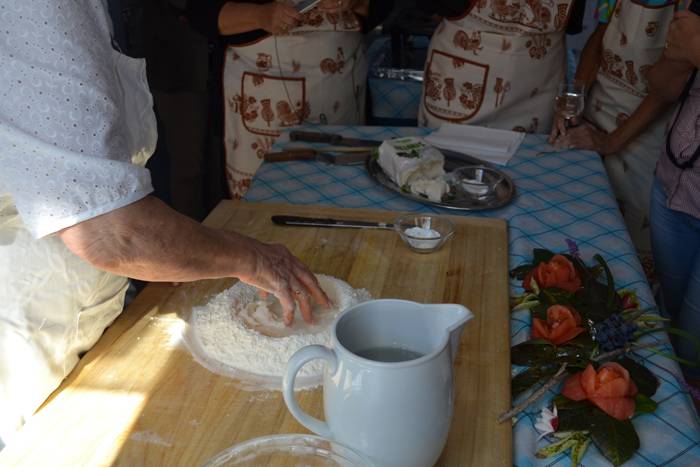 Nonna Violante shows how to mix flour with water and lard to begin kneading the dough for piadina. 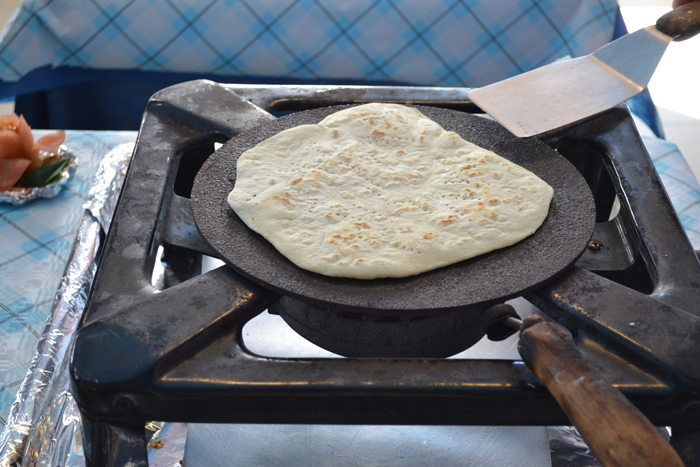 The hot griddle used for cooking piadina (that’s the one I prepared, hence the not-so-perfect round shape). 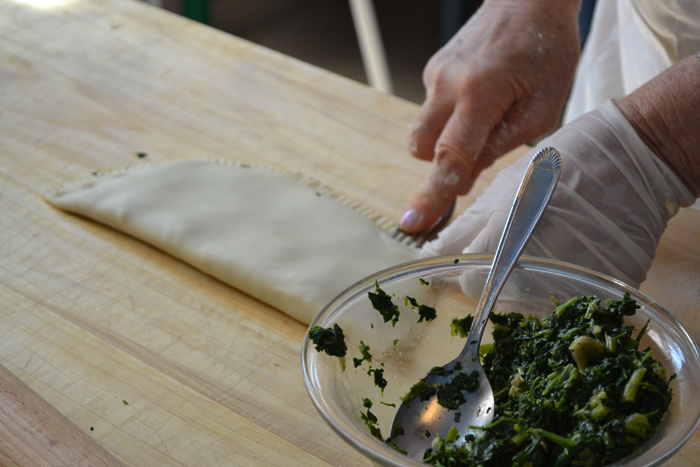 Making cassone romagnolo, a variation on piadina – it is folded and filled with ‘erbette’. Delicious ‘cassoni con erbette’, almost ready! Mi è venuta una gran voglia di piadina!!! Mmmmmmmmmmm those cassones were absolutely wonderful and soooooooo tasty weren’t they Silvia!!! A great post, keep ’em coming!! Wonderful Demonstration . I feel to visit . Thank You .